Making his second rehab start from the team’s major league parent club, Gonzalez tossed five more shutout innings to earn the win in Spokane’s 5-4 victory over the visiting Everett AquaSox on Friday afternoon at Avista Stadium. It sent Spokane to its first Northwest League championship series since 2010. The Indians last won the title in 2008, when they beat Salem-Keizer. Gonzalez said he expects to pitch at some point in the championship series as he continues his rehab from Tommy John surgery 14 months ago. The best-of-five championship series starts Sunday in Eugene, where it will stay for its entirety. 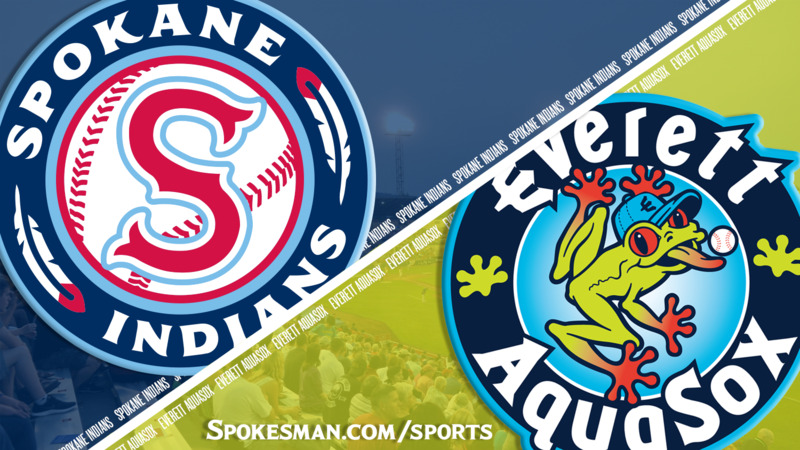 Spokane will be considered the home team for the first two games but won’t host at Avista Stadium because of the Spokane County Interstate Fair, which is held next door. Instead, the Emeralds will host, after upsetting the Hillsboro Hops in the South Division playoffs. That means the team with the worst overall record in the NWL this season will play with home-field advantage for the entire championship series. “We have a lot of confidence going into Eugene, and we’re gonna give them our best shot,” said Cole Uvila, who pitched scoreless sixth and seventh innings in relief of Gonzalez. Unlike Sunday’s division-clinching win over Vancouver when he retired all 15 batters he faced, Gonzalez wasn’t perfect. He scattered four hits and didn’t strike out anyone. But he induced mostly ground balls and tossed threat-free innings. That allowed Holmberg to hand multirun leads to three of his best relievers – Uvila, Wes Robertson and closer Emmanuel Clase – at each pitching change. J.P. Martinez’s first-inning solo home run to deep right – into the Fair parking lot – gave Gonzalez a lead to work with. Sherten Apostel, who finished 3 for 3 with two RBIs and a walk, added a run-scoring single in the third to make it 2-0. In the seventh, the Indians scored three more runs to give them a 5-0 lead. That cushion proved key, because the AquaSox finally did get to the Indians pitchers in the eighth. With a man on second, Cal Raleigh blasted a home run to right field off Robertson to make it 5-2. After a fielding error – one of the Indians’ four on the afternoon – allowed Bobby Honeyman to reach first, Clase entered. The first batter, Ryne Ogren, smacked a ball that ricocheted off Clase toward short. But Jax Biggers changed course, snagged the ball with his glove and quickly threw to first to get Ogren by a step. That ended the inning – but it wasn’t the AquaSox’s final threat. With one out in the ninth, Connor Kopach singled to left then Jansiel Rivera blasted a home run to left center, cutting the lead to 5-4. But Clase retired two of the next three to end the game and the best-of-three series. The Indians’ season continues, heading to a city where they won two of five games in early August, against a team making its third consecutive championship appearance. Published: Sept. 7, 2018, 5:17 p.m. Updated: Sept. 7, 2018, 5:45 p.m.